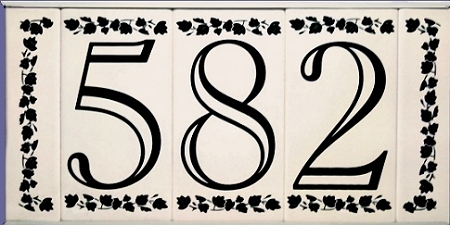 These ceramic tiles display up to seven 4" house numbers on 6" H x 3" W tiles in a slimline frame. - Pre-assembled. Ceramic tile is adhered to the frame. 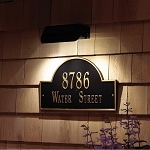 The plaque is made of separate ceramic tile that are held in a powder coated steel frame. There is a back plaque that has four indentations for hanging on round head screws. 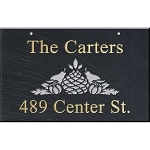 The width of your plaque is dependent upon the total number of tiles (maximum of seven). A decorative vertical half tile will always be placed on the left and right sides.